It looks like Jameson Cult Film Club wins the internet again, over the last week they have been teasing us with cryptic clues and today that announced that they will be rolling out their famed green carpet to host the Gala Premiere of Seven Psychopaths and you can go for free. More than 500 London films fans are set to receive an experience like no other when Jameson Cult Film Club hosts a live, immersive event for the Gala Premiere of Seven Psychopaths before its release in UK and Irish cinemas on December 5th. The much-awaited new release from In Bruges director, Martin McDonagh is a darkly hilarious, blood-soaked black comedy, well-worthy of Jameson ‘Future Cult’ status. The twisted tale centres on Marty (Colin Farrell), a struggling screenwriter who inadvertently becomes entangled in the Los Angeles criminal underworld after his oddball friends (Sam Rockwell, Christopher Walken) kidnap a gangster’s beloved Shih Tzu. Guests will be treated to the usual Jameson Cult Film Club experience at the Oval Space, a warehouse in Bethnal Green that will transport the audience into the film’s universe of dog-filled warehouses and Joshua tree-lined deserts, with a whole cast of psychopaths on hand to bring the film to life. 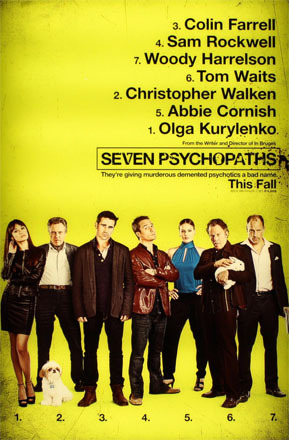 Guests will also get to experience the VIP treatment as they walk the red carpet and watch Seven Psychopaths before its general release on 5th December. The screening will be followed by a live audience Q&A with confirmed attendees Sam Rockwell and Martin McDonagh. Anyone who wants to be a part of this incredible evening should register for free tickets via the Jameson Cult Film Club Box Office, which can be found at – facebook.com/jamesoncultfilmclub. The Box Office will open shortly and registered members will be the first to know when tickets become available.